Home » Rock Tumbling Library » What Are Petoskey Stones? Photos of two beautiful Petoskey Stones. The one on the left is in "as found" condition from the Sturgeon River in Cheboygan County, Michigan. The one on the right is a nicely polished Petoskey Stone collected in Emmet County, Michigan. Photos by David Fred (left) and the Children's Museum of Indianapolis (right) used here under a Creative Commons License. 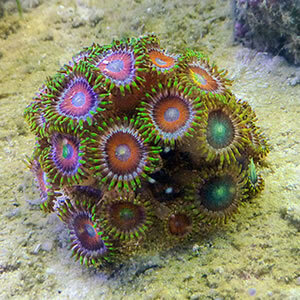 A living colony of zoanthus coral with multiple polyps open. This is a small example of a colonial coral similar to the ones from which Petoskey Stones have formed. Photograph by Kazvorpal, used here under a Creative Commons License. A Petoskey Stone is a fossil of a colonial coral (Hexagonaria percarinata) that lived in a shallow sea during Devonian time about 350 million years ago. When the corals died they were covered with sediment and became part of a rock unit known as the Alpena Limestone. The Alpena Limestone outcrops along the coast of Little Traverse Bay near the city of Petoskey, Michigan - which is the town for which the stones have been named. The calcium carbonate exoskeleton of the coral colony is what became a Petoskey Stone. The fossil corals range in size from small specimens of a few animals that are an inch or two across to large colonies that can be several feet across and weigh over 1000 pounds. A photo of a modern colonial coral is shown in the photo at right. During the Great Ice Age, glaciers scoured northern Michigan, breaking up the Alpena Limestone and scattering the fossil corals in glacial till across the landscape of the Great Lakes Region. Streams and waves then reworked the till, shaping the fossil corals into smooth round "stones". Petoskey stones can show up almost anywhere! People pick them up, carry them around and give them away. 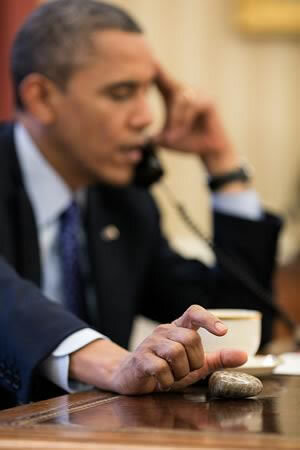 Here's a photo of President Obama with a Petoskey stone. News reports said that the stone was a gift from a Michigan resident. Petoskey stones are the "offical state stone of Michigan" and the President used to fiddle with the stone when he talked on the phone. Today these rounded pieces of fossil coral are known as "Petoskey Stones". They are commonly found along the shores of Lake Michigan, which is where many people encounter them. They are also found in and along streams, in road cuts through glacial deposits, in farmer's fields and in quarries that mine the glacial deposits for sand and gravel. They are found at many locations along the eastern shore of Lake Michigan and in inland deposits. Petoskey Stones - A Rock Hound Favorite! Petoskey Stones are a wonderful find. The ones that have been worked by streams and waves can be very nicely rounded, with a very smooth surface and a beautiful hexagonal pattern of the fossil colonial coral. Each of the hexagonal chambers was the home of a tiny coral polyp. The smooth, rounded outline, the hexagonal pattern and their attractive gray to brown color make them stand apart from all other local rocks. People who find Petoskey Stones, marvel over their interesting shape and the intricate hexagonal pattern. Rock hounds have been searching for them and collecting them for over 100 years. The Petoskey Stone is so popular in Michigan that it was named the official "state stone" in 1965. 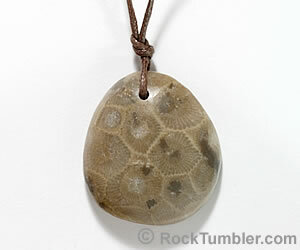 A necklace made from three Petoskey Stones and two Charlevoix Stones (These are similar to Petoskey Stones but are Favosites, a different species of coral. Photo by OnyxRain © iStockphoto. Petoskey Stones are beautiful when polished. Polished Petoskey Stones have become one of the most popular souvenirs of northern Michigan. They are also cut into cabochons, made into jewelry, and used to produce a variety of ornamental objects from bookends to clock faces to jewelry boxes. Petoskey Stones are unique to the Great Lakes Region of the United States, however, there are many other types of fossil colonial corals that can be found as rounded stones. Most of these are not as widely known or as popular. In Michigan there is the Charlevoix Stone, another fossil coral (Favosites) that looks almost identical to the Petoskey Stone but has much smaller coral chambers. It was named after the Charlevoix area where it is commonly found. Similar corals are known from Alaska, Indonesia and many other areas. Sometimes they are composed of agate instead of calcite. 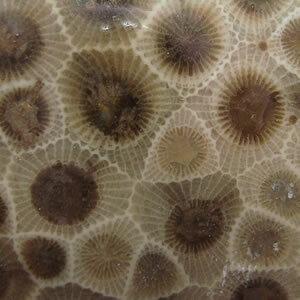 A close-up photograph of a polished Petoskey Stone showing the hexagonal chambers occupied by the coral polyps. Public domain photo by Lemonpeeler. Before you decide to polish your Petoskey Stones examine them carefully. Only the best stones are able to accept a polish - these stones are solid, without pore spaces and without deep pits. If your stones do not meet this description then save your time. You will probably not be happy with the results. Select only the nice solid stones for polishing. Petoskey Stones are very soft compared to most other rocks that are polished. They are composed of calcite which has a hardness of 3 on the Mohs Hardness Scale. Many people who polish Petoskey Stones do the entire job by hand or on a lapidary polisher with an expanding rubber wheel. They start with a well-rounded stone and wet sand it smooth by hand using water and wet sandpaper. They begin sanding with 220 grit wet sandpaper and smooth the entire surface of the stone. They then wet sand the entire surface thoroughly with 600 grit wet sandpaper. They polish using cerium oxide or aluminum oxide on a soft piece of wet corduroy or wet felt. Sanding and polishing a small stone a few inches across can take an experienced person an hour. If you have access to lapidary equipment, Petoskey Stones can be wet sanded on a rubber wheel using a 220 grit sanding belt, followed by wet sanding with a 600 grit sanding belt. Because the stones are so soft they cut quickly and require a light touch. Polishing is done wet on a flat lap covered with felt using cerium oxide or aluminum oxide polish. This method is much faster than doing all of the work by hand. A rock tumbler can be used to smooth rough Petoskey Stones. It is impossible to say how long you should tumble them. That can only be determined by their shape going into the tumbler. If they are broken pieces or very irregular in shape a day or two in coarse grit (60/90) might smooth their surfaces. Because they are so soft you should check on them often to be sure that you don't tumble them too long and severely reduce their size. Skip coarse grit if they are nicely shaped and run them a day or two in medium grit (180/220). After medium grit a day or two in fine grit (500 or 600) can smooth their surface. Most people who polish Petoskey Stones do the polishing step by hand with a cloth on a felt-covered flat lap as described above. 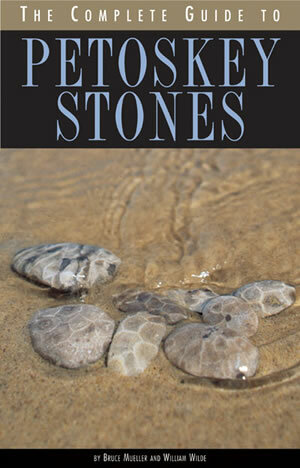 This is the best book for learning about Petoskey Stones and how to polish them. We recently purchased a copy from the University of Michigan Press for only $12.95 and learned a lot from reading it. Highly recommended. The Complete Guide to Petoskey Stones, by Bruce Mueller and William Wilde is the most detailed information source about Petoskey Stones that we have found. It explains how they were formed and scattered across the Michigan landscape. It gives detailed information about many locations where you can find Petoskey Stones. It explains where it is legal to collect Petoskey Stones and where collecting is forbidden. The book gives detailed instructions for polishing Petoskey Stones by hand and by machine. How to Polish Petoskey Stones, is an article that Steve Hart, author of Modern Rock Tumbling, has published on his website. Steve decided that the tumbler was great for shaping the stones and smoothing their surface, but for polishing them he uses cerium oxide on a vertical polishing wheel. Some history, lore and facts about the "Petoskey Stone" is a State of Michigan fact sheet. 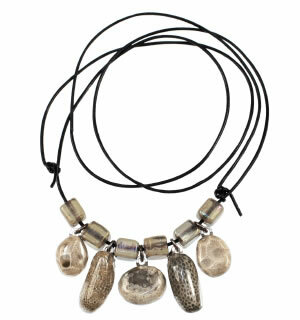 It describes how Petoskey Stones are formed, where they are found and how to polish them. How to Polish a Petoskey Stone, an article by Kathy Miling, is the best online description of how to polish a Petoskey Stone that we have seen. She has polished lots of Petoskey Stones and has some nice ones for sale on her website.